A beautifully staged publicity sketch for the film Bambi. At the center of attention is the skunk Flower, who is being told that even he could become twitterpated. 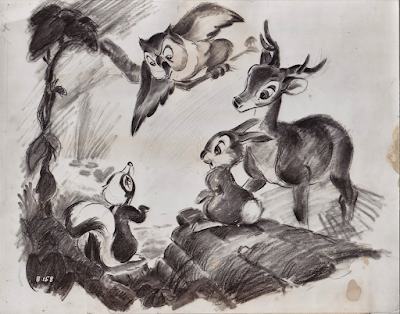 Bambi's, Thumper's and particularly Owl's pose clearly help guide the viewer's attention toward Flower, who stands isolated in the lower left corner. A simple and very effective composition.